I am so ready to see some Spring green! 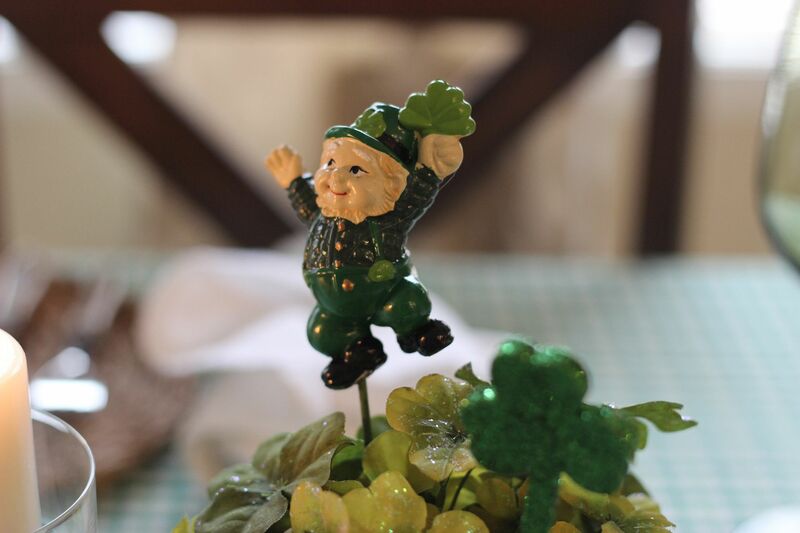 So ready in fact that I went ahead and set the table for St. Patrick's Day! I started with a green plaid tablecloth I've had for a few years. Next came my favorite woven grass placemats from Goodwill. I then layered our everyday Gibson dishes and bowl at each setting. 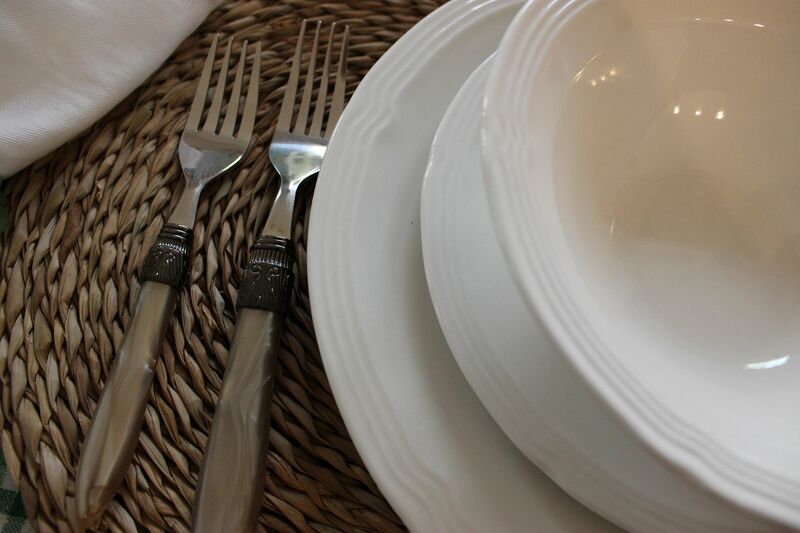 The flatware is from Cost Plus World Market. 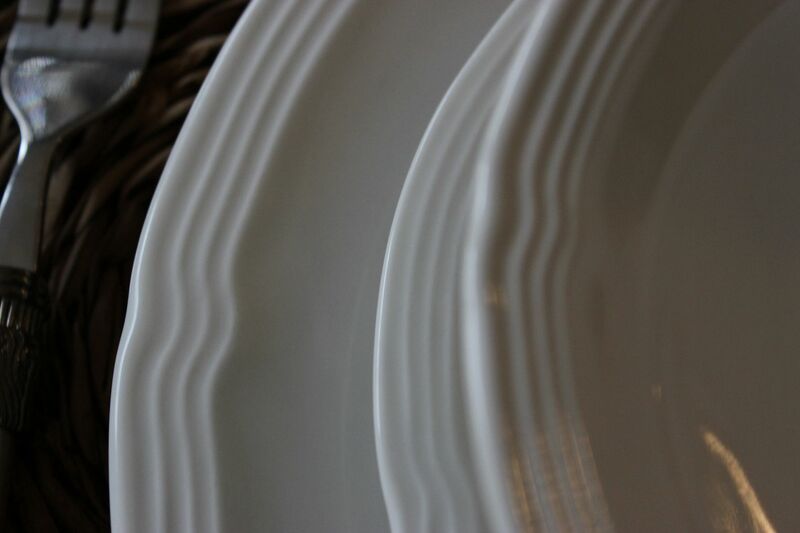 Even though the dish set was inexpensive, I loved the wavy pattern on the edges. 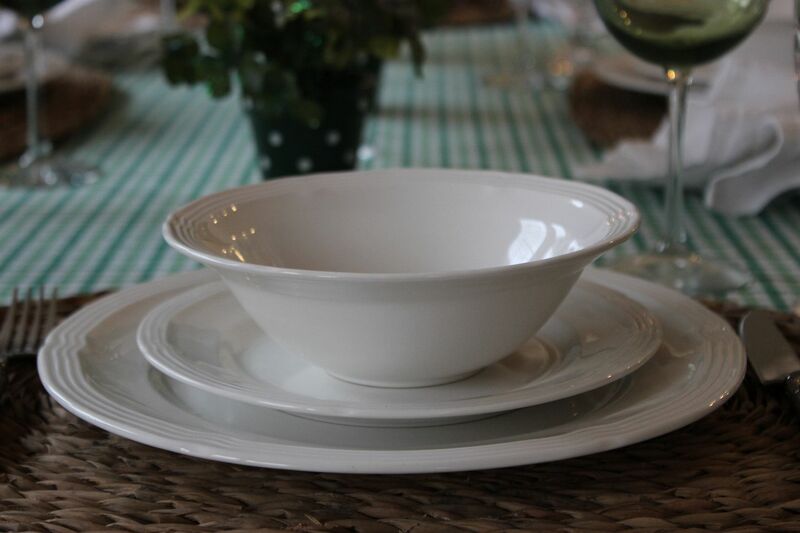 And, no tablescaper is without a set of basic white dishes. The same could be said for napkins. You always need one set of sturdy white ones. 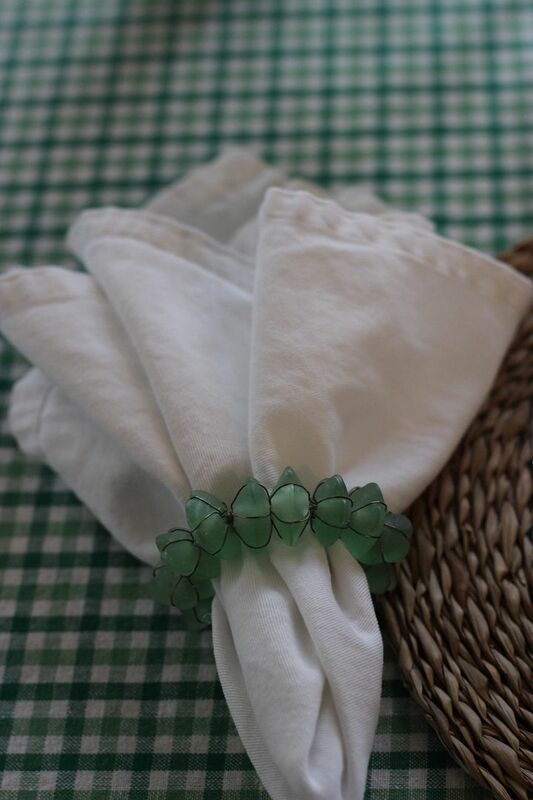 Then, you are able to add color with napkin rings, also from Goodwill. 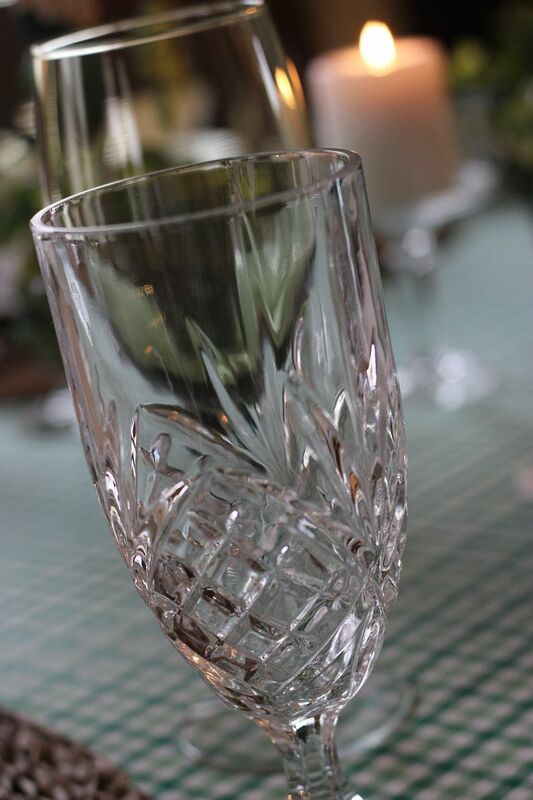 I used my favorite Irish cut crystal water glasses and green goblets from the Dollar Tree. Setting a pretty table need not be expensive. 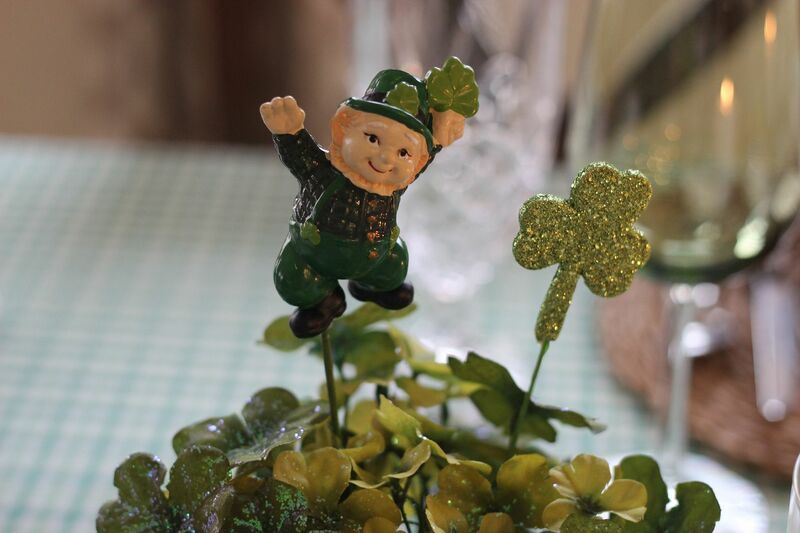 For the centerpiece I picked up 3 green and white polka dotted pots with faux shamrocks from Michael's and placed a fun Leprechaun and a glittered shamrock pick in each one. Isn't he so sweet and cheerful? I'm hoping one will tell me where he has hidden his pot of gold! I placed a candle in several dessert glasses for some more shine. And set them between the pots. Our lawn may still currently look like straw placemats,but my table is wearing the various greens of Spring! 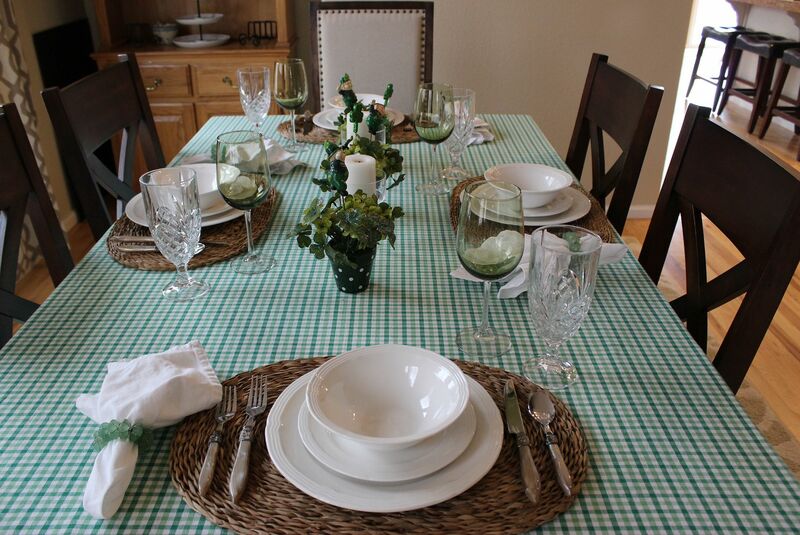 Kathe ... the table setting looks so fresh ... the tablecloth is just perfect. Beautiful. Love the tablecloth~ Such a pretty table! Very pretty! I love all the green, and those dishes are gorgeous! This turned out so cute!! Love that tablecloth! 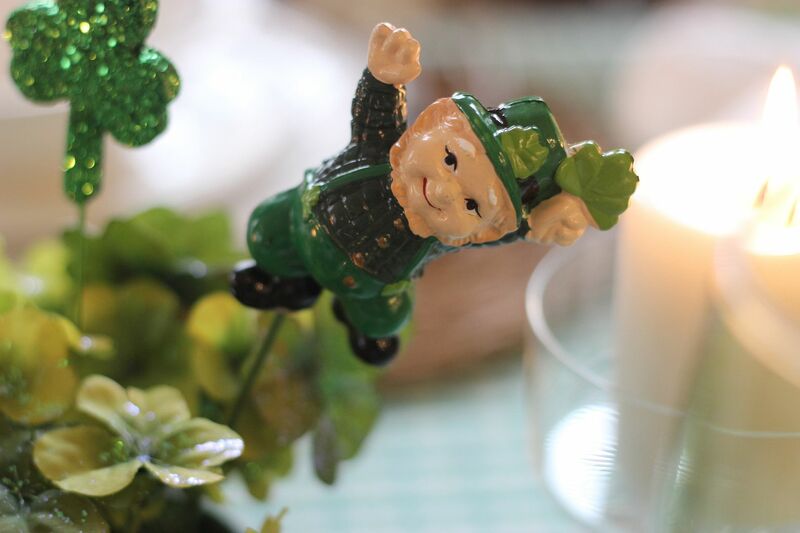 St Pat's is almost here so I best think about a table myself! Your table turned out lovely. 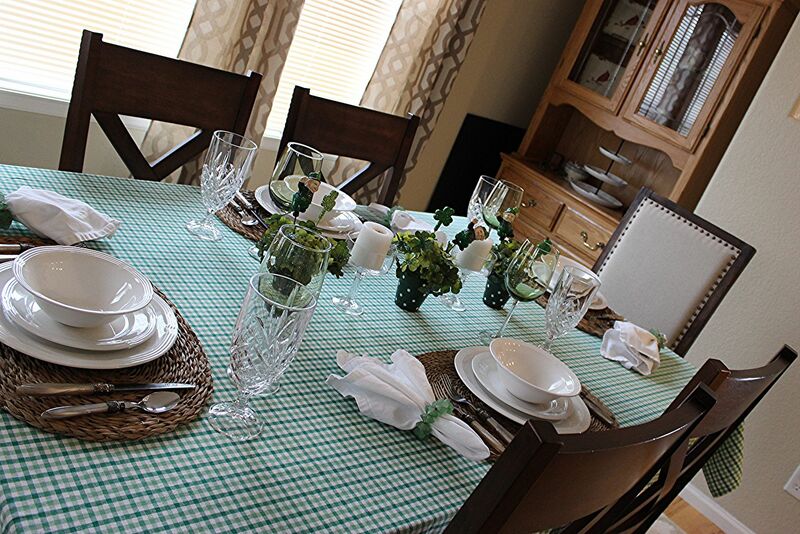 Kathe your table looks so decorative and beautiful! You but my table to shame! Enjoy your week hun! This table is so stinkin festive and cute!! Loving those white dishes. Love your tablescape! The silverware is gorgeous! Looks beautiful! Love the leprechauns,,,Happy St. Patricks day! So happy little men you have over there! They are sure spreading good mood around. Love it! It's great to see the green especially at this time of year! I like your accents- the leprechauns are too cute! I just created my centerpiece and now to do the table! See you at the blog crawl! Very festive Kathe! 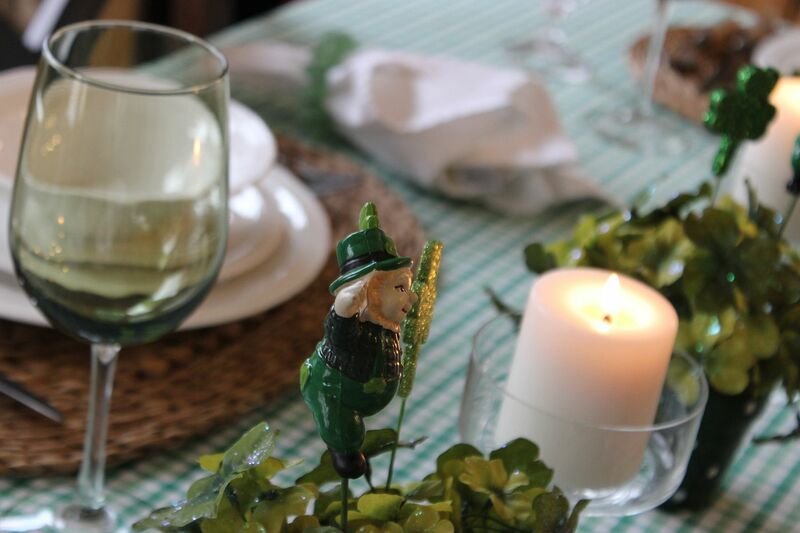 A perfect St. Paddy's day table! The little centerpieces you made up are adorable! I love the green gingham checks. Everything looks so light and airy. It encourages me to think a breath of spring may soon blow this way. I really appreciate your woven chargers. I found mine at Goodwill too. I looked at a set at Pier 1 years back and just thought to myself that no way was I going to pay that kind of money. Eventually they showed up at Goodwill for a dollar each. Today I found square woven chargers at the Goodwill, but now they are two dollars each. Kathe your table is so darn cute and I love that tablecloth. Don't you just love Cost Plus World Market. Hubby and I go on date nights. Super-cute, Kathe! 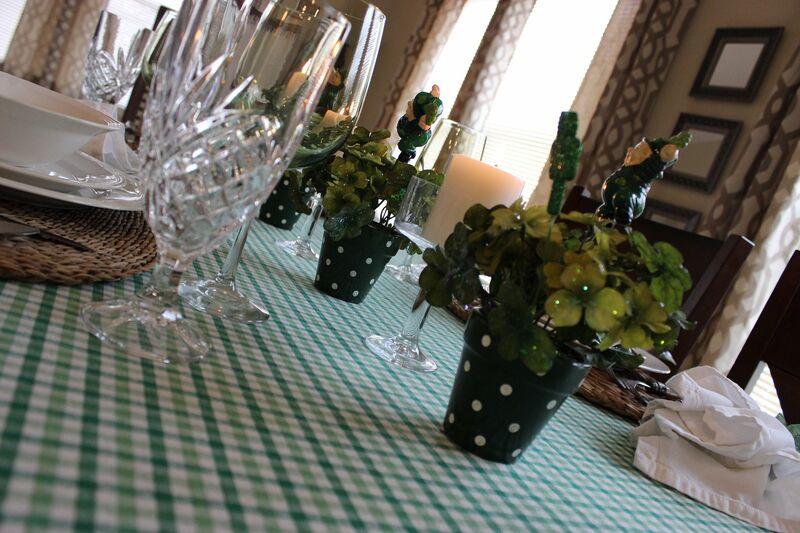 That tablecloth is the perfect base for your St. Patrick's Day table, and the pots of shamrocks are darling! I am slowly being won over to the White Dishes Fan Club. They really look great on this table! What a nice table setting, Kathe! 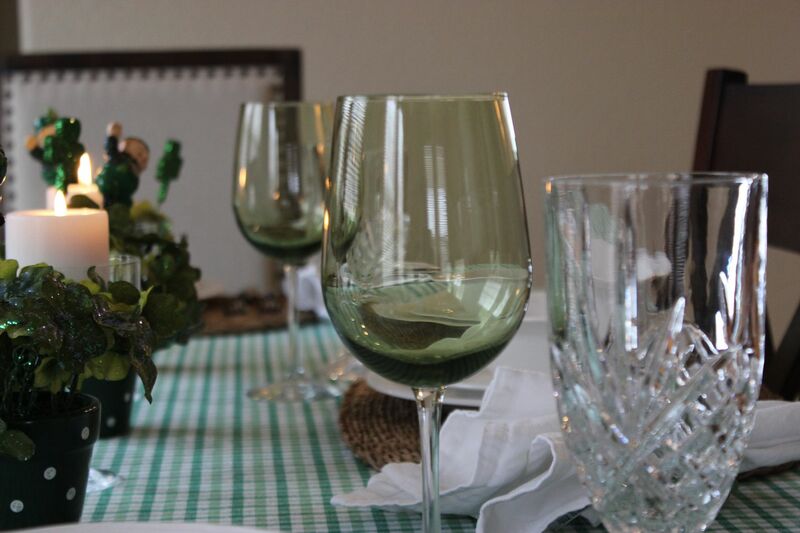 I love the entire table - but I really love those water glasses and green goblets! Your green and white is so refreshing! Great tablecloth . I didn't have white dishes till I started on the Holidays forum. How did I live those near 35 married yrs without them? Now I have a few...a few too many of everything. Thanks for joining in my traditional Irish celebration! Jig on! I saw this on Bloglovin but it would not let me comment. Your table is very cute, well thought out -- I love it! 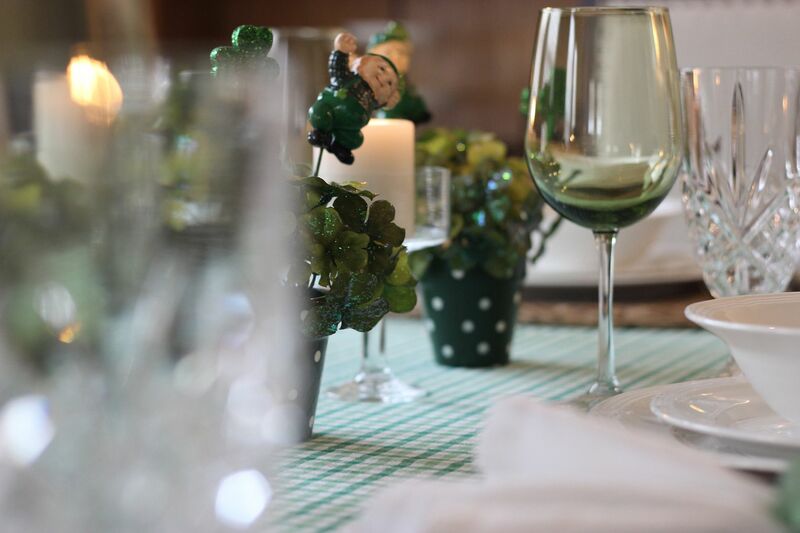 Everything looks so festive for St. Patrick's Day, cute table! 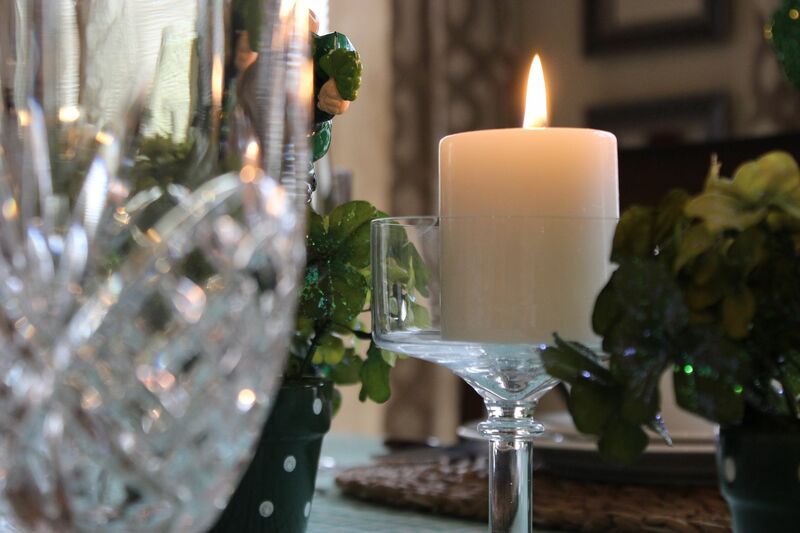 Shamrocks, leprechauns, Irish crystal, and lots of green……your table is ready to celebrate. Happy St. Pat's Day! Beautiful crystal and I love your centerpiece. 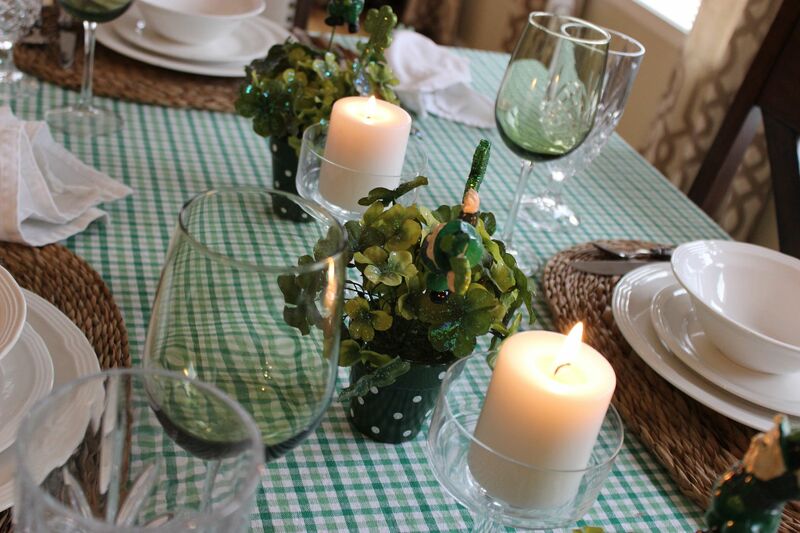 A very pretty green tablecloth to celebrate St. Patrick's Day! Your green goblets from Dollar Tree are so versatile. Have a blessed March 17th! You've got your table all right for sharing of the green. I'm so envious of your finds at Goodwill and Dollar Tree. I'm never so lucky! 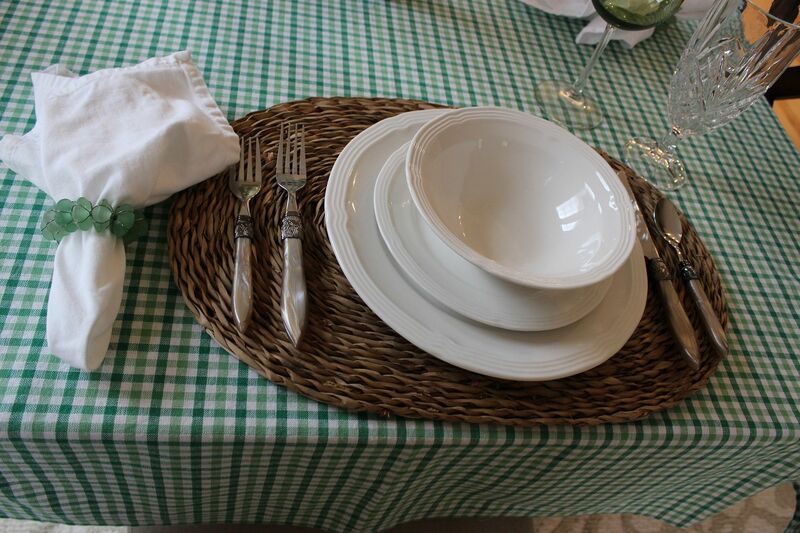 I agree a must have white dishes & white napkins, You did a great job putting it all together for St. Patricks table. Cute pots, I could useeee!! !